Regular readers might have noticed that I like a bit of randomly generated exploration. Whether it’s Cursed Loot, Mega Monster Mania, Lair of the Evildoer, Dead Pixels or the newly released Spelunky, the phrase ‘randomly generated’ (or ‘procedurally generated’) sets my heart a-flutter like I’m a chaste maiden in a period novel. It doesn’t always work out, but the sheer animal magnetism is always there. 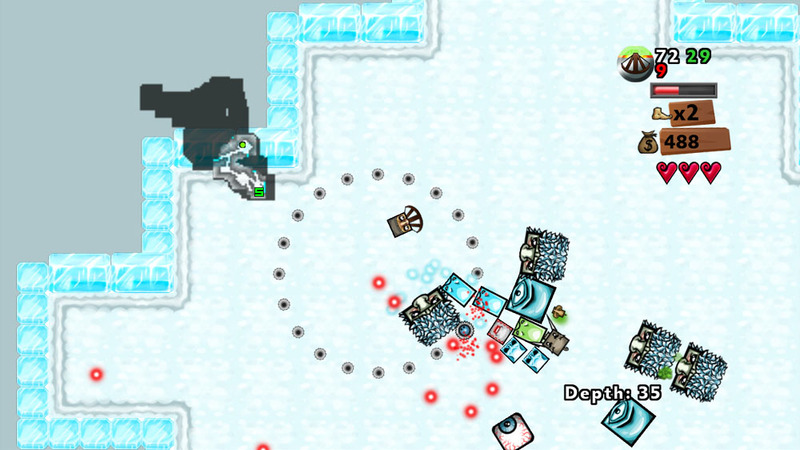 Sushi Castle, just released by Milkstone Studios (the developer of the delightfully antagonistic Infinity Danger), grabs pretty much everything I like about randomised dungeon crawling and throws it all together. 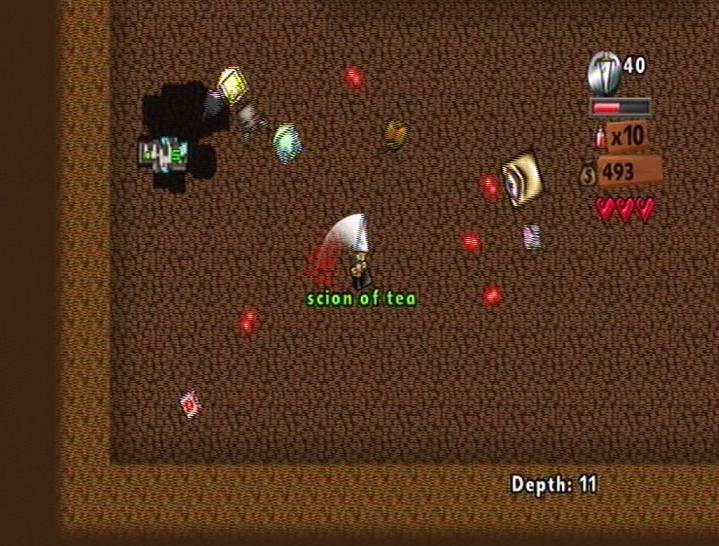 In the manner of a roguelike, you have one solitary life in which to explore as much as you can of a series of randomised floors, killing everything that moves and picking up everything that doesn’t. There are a couple of catches, though. The first catch is that the actual control works like a twin-stick shooter. None of this turn-based walking into enemies to damage them. Instead you open fire and circle strafe like it’s Infinity Danger all over again. The second catch is that in place of huge quantities of largely interchangeable loot, you instead pick up a small number of very different items that modify your abilities. Where many dungeon crawlers have you switching from Ragged Loincloth +1 to Reinforced Pantaloons + 3 as you pick up a modest junkyard’s worth of miscellaneous brick-a-brack, Sushi Castle doesn’t. It eschews equipment in favour of one-offs that are usually found in special rooms only once or twice per floor, like the Ninja Cloud that enables you to fly and the stodgy snack that gives you a health boost but makes you walk like you have EA’s DLC catalogue strapped to your feet. The upshot of all this is that while many randomised dungeon crawlers promise replayability yet offer only repetition with minor variations, Sushi Castle is genuinely hugely replayable. The differences between playthroughs aren’t just a matter of fractionally different stats on your Orcish Linguini Spatula of Flaying but real, tangible changes that alter the way the game plays out. This also forces you to be adaptable. Sometimes you might be a damage sponge with a ton of health, while other times you’ll be a glass cannon with high damage but no means of defence. Sometimes you’ll rely on bombs to deal serious damage, and other times you’ll have to make use of your manoeuvrability. You have to be able to play in a variety of styles, because you never know how your character will end up developing. The game’s greatest strength is its most conspicuous weakness. Some attempts can feel doomed from the start if you can’t find the right items to unlock shops, or you keep picking up stat reductions through sheer bad luck. The game’s scrolls and sushi have randomly assigned effects that can be very positive but also sometimes very negative, and it’s frustrating to have an otherwise successful playthrough suddenly fall apart because you unwittingly used a scroll that filled the room with live bombs. This isn’t a huge problem though, and the benefits of this truly unpredictable approach to dungeoneering outweigh the drawbacks. For only 80 Microsoft points, there’s a lot of play time in Sushi Castle. In principle, you can play it indefinitely without having the same experience twice. I’ve already got my money’s worth out of it with hours of play time invested, and I’m still seeing new items popping up all the time. Just to add delicious icing to the cake, Milkstone Studios plan to add new features when they reach specific sales landmarks. It’s an interesting approach that is increasingly common in indie games, and personally I find it far preferable to demanding more money in exchange for negligible additions. Oh, one more thing. I have to mention this or my journalistic credibility badge will be repossessed and used to fund nefarious criminal activities. For better or worse, Sushi Castle is Edmund McMillen’s Steam hit The Binding of Isaac. There are a few differences – the ability to fire diagonally, some of the bosses and one or two enemy types – but 90% of the game is lifted directly from Isaac and just re-painted. The way the game generates everything in general, its item room/shop/gauntlet room set up, its bomb/key/special item system, the enemy types, the item effects – the majority of these things are exactly the same. 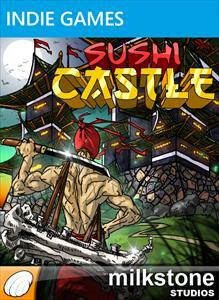 Sushi Castle would be stretching the acceptability of being ‘inspired by…’ to its limits. Having said that, if your computer can’t run The Binding of Isaac, or you hate Steam, or you just prefer to play from your sofa rather than a rigid office supplies chair, this might be the game for you. I recommend Sushi Castle because it’s good fun, it’s generally executed well, and the way it handles randomised dungeon crawling means it’s still entertaining after hours of play. For the price, you won’t get many better deals. It’s just a shame that all of its qualities are actually something else’s qualities recycled, with no voice of its own. Xbox Live Indie Games isn’t starved for roguelikes. What it is starved for is games about hyperactive, ice-skating square heads swinging swords like obelisks in frantic drive-by slashings of kamikaze baby seals. Initially, Mega Monster Mania gives the impression of being a dungeon crawl. 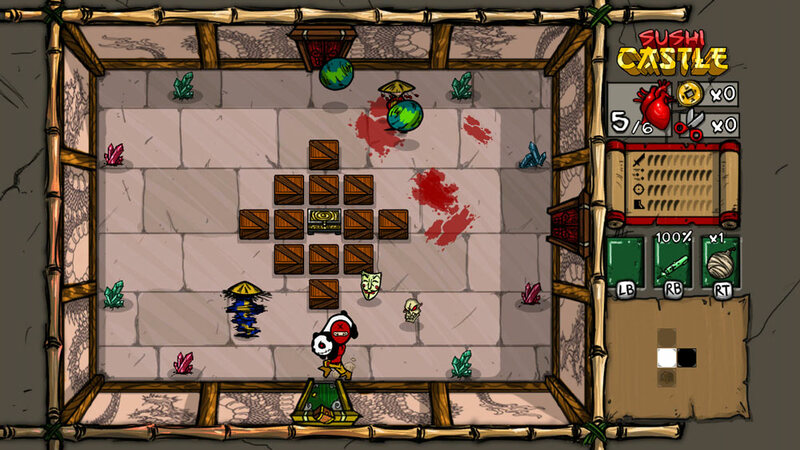 There are a few of those on XBLIG, perhaps the most reputable of which is Epic Dungeon (now updated as Cursed Loot). If you loosen the definition to include games that aren’t strictly roguelikes/dungeon crawls but share many qualities with them, such as Lair of the Evildoer, the number is quite healthy. 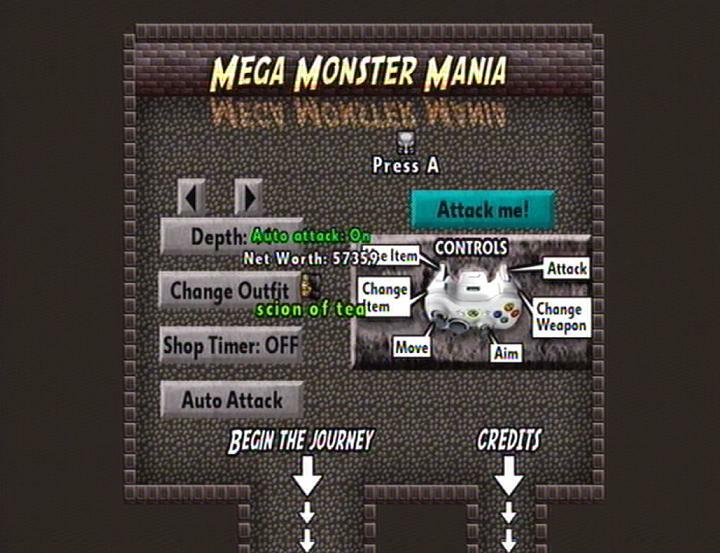 Mega Monster Mania fits best into this latter category; it has elements of a dungeon crawl, others of a traditional roguelike, and some qualities of a sugar-fuelled child convulsively beating its fists against every object in sight because it just has too much energy not to. And that’s what really sets MMM apart from its fellows, in the simplest terms: energy. An unusually small weapon. So to speak. Roguelikes traditionally centre around trawling for loot through a series of randomly generated floors, the layout of which is revealed only through exploration. Mega Monster Mania does tick all these boxes, but it doesn’t stop there; it continues ticking right to the edge of the page and onto the table, giggling all the while. The most traditional games in the genre (on XBLIG, Dungeon Adventure comes to mind) are quite slow, deliberate affairs despite the rapid pace of their combat. They emphasise slogging along lengthy corridors, mapping out each floor until you find the exit or tire of looking for loot. Even Epic Dungeon, which accelerates the pace somewhat, has the feel of a steady trudge. This isn’t a criticism; that’s just the nature of the genre. Mega Monster Mania, in contrast, is the cocky blue hedgehog of dungeon crawls. It looks into the tarry stew of the roguelike, and spices it up with the tabasco of Gauntlet. Everything happens very quickly. 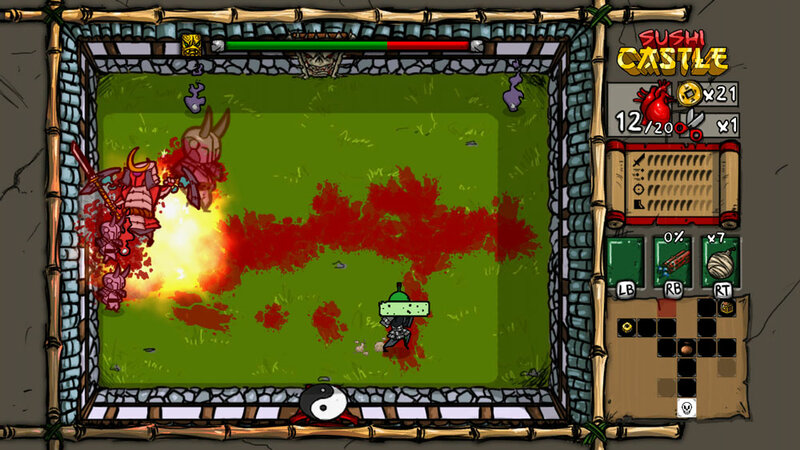 Enemies charge at you full-tilt whenever they see you, and many of them move faster than you do. Some shoot fireballs in various patterns. But the sense of speed comes mainly from two features. Firstly, literal speed of movement. Your character skates around everywhere like the 80s never left us, and you will often find yourself accidentally ploughing headlong into a throng of monsters. It’s particularly noticable in the ice stages, which follow the traditional game ice route of dramatically reducing friction. Your character feels like a pinball in these levels. It’s not just you, either; many of your enemies move similarly, giving them an erratic edge that cranks up the panic when you blunder into a room that’s teeming with them. Secondly, the control scheme resembles a twin-stick shooter. This makes sense when using a bow; you nudge the right stick in any direction to launch an arrow that way, or hold it for sustained fire. More often, though, you’ll be swinging a sword the size of a small car, and this too is done using the right stick. Me choosing my haircut by bashing a huge grey block. Barbers are so passé. 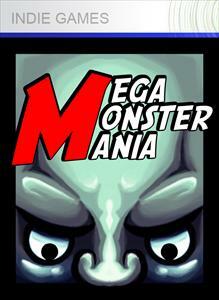 These two features combine to give Mega Monster Mania a frantic pace. Personally, I coped with this by developing a joust-like style of combat: after popping off a few arrows from a distance to soften up my enemies, I charge in headlong, narrowly avoiding my target and carving it up with my sword as I pass, before pulling a skidding 180 to make another pass. Action definitely seems to be the name of this game. When MMM‘s developers threw the traditional trundling pace on the junk heap, they followed it with character levelling. Of course your character needs to grow in power to cope with the increasing challenge, but this is done entirely through equipment. 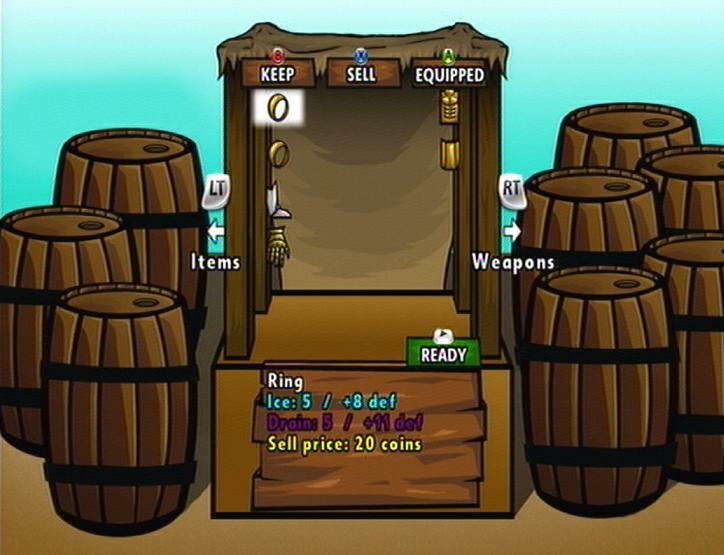 The game’s item drops fall into three types: usable items (a handful of trinkets that offer short-term bonuses or quick damage), money and equipment. Even your gear isn’t permitted to slow the manic pace, as new weapons and armour can only be equipped in the shop at the end of each floor. So there’s no need – or option – for inventory management, or even simply glancing to see what you just picked up. All you can do is charge onward to the exit. Once there, you can weigh up the damage, protection and bonus status effects of the gear you grabbed, sell anything you don’t want, and move on. I can’t give a fair look at Mega Monster Mania without commenting on the visual style. This was the first thing that struck me when I started playing, thanks to its oddness. Initially I couldn’t decide whether it was intentionally distinctive or just lazy. Your character is a square, with some hair and a pair of eyes to indicate that you’re meant to be looking down on the top of someone’s head. No visible limbs or animation, just your little square guy and enemies that are often (though by no means always) similarly geometric. It was a little baffling at first, but once I got used to the style I actually quite liked it. These visuals combined with the rocket-propelled pace of gameplay give the game a quite distinctive feel that cements it in my memory much more firmly than its forgettable title does. Besides, colourful yet minimalist seems to fit MMM‘s general demeanour. Sadly, Mega Monster Mania hasn’t managed to shed the main failing of the roguelike dungeon crawl: repetition. Even the best of this genre fall prey to the eventual feeling of battling through yet another floor full of enemies, opening chests and swigging potions, and MMM is no different. Its pace helps to stave this off, but the trade-off is the lack of depth that would be provided by customisation through levelling – the method by which others like Epic Dungeon fight to hold our attention. Unlike most of its counterparts, MMM hasn’t really bothered to implement a save system. A save would be good. On the opposite side of the scale, no save at all could work – have each adventure be a fresh one, pushing as far as possible into the dungeon from the beginning. The problem here is that the game sits uncomfortably between the two. It remembers which floor you reached and lets you keep your equipment, but your items and gold are reset to basics (ten potions, no other items, no gold). The lack of gold is particularly troublesome; a few floors down, you’ll need every potion you can get, and the game doesn’t play very fair in cutting you down to ten with no way to buy more just because you decided quit and come back later. Even your character’s appearance has to be selected anew, and while this is entirely cosmetic and simply a matter of selecting one from a handful of options, it’s still an unnecessary inconvenience. The other major problem with the game is the clumsy item selection system. For the most part the controls are minimalist, and effective for the rapid battles. Flick between weapons (which you will mostly only have two of) with RB, and attack with the right stick. Easy. Unfortunately, there are several usable items in your inventory, and these are selected by the same method as weapons – you cycle through them with LB. Considering how quick combat is, having to tap the button four times to reach a potion or bomb can get you killed. Not to mention the hassle of memorising the sequence of items so you don’t have to risk your life glancing away from the action to check whether you’re about to drink a life-saving potion or give yourself a speed boost right into a monster’s spiked face. It wouldn’t be so bad if we could work around it by selling off items we never use (in my case, the aforementioned speed boost) but, unlike equipment, these consumables can’t be sold. No motion blur here. Thanks, Xbox.com! Ahem. These flaws aren’t fatal though. Mostly they’re minor niggles, and even the awkward middle-ground semi-save is only a noticable problem if you frequently leave and return – and you probably won’t. It’s not that sort of game. It’s one you’ll play in occasional bursts of an hour or two. As to the other problems, the use of consumable items becomes key to your success as you progress further, and you’ll soon learn which ones you use most and be able to select them on the fly. A lot of the time you’ll be able to tell when you’re about to enter an area crawling with enemies, and can have a plan in mind to use a certain item before quickly switching to another. I’m not excusing the clumsiness but it doesn’t ruin the game, and it’s hard to think of a better to way to implement it that wouldn’t necessitate letting go of one of the sticks in the middle of chaotic combat. Taken as a whole, Mega Monster Mania comes recommended. It’s easy to learn and easy to play, but not easy. It provides the procedurally generated exploration hijinks of a dungeon crawler, but streamlines everything and cranks up the speed to an alarming pace. Its odd visual style is quite charming once you adjust, and if you have a friend who fancies tackling a high-speed loot trawl with you, there’s a two-player mode, though it seems to be local only. If you have the slightest interest in charging through dungeons full of enemies in search of treasure, you should give Mega Monster Mania a try. And if you’ve tried the likes of Epic Dungeon or Dungeon Adventure and found them a bit sedate, this might be right up your street. With even the full game costing a mere 80 MSP, you really have nothing to lose by giving it a go.